"United Methodist Women has opened my eyes to so much, from personal spiritual growth to awareness of community needs and worldwide needs. And not just worldwide needs but also opportunities to get to know people through all those programs that they bring to us and information that is made available to us: workshops, Mission u, the Assembly. ... I'm not sure that I got any of the informationnot even a fourth of the information that I knowthrough any other source than United Methodist Women." Ilda Vásquez says this with certainty. And she has decades of involvement in United Methodist Women to back up her conviction. Ms. Vásquez, one of six children, grew up in Edcouch, in deep South Texas, about 10 miles north of the border with Mexico. She attended Texas Women's University, and she met her husband on a blind date over a Christmas break. They have been married for 49 years and have a son and a daughter. A military family, the Vásquezes lived in Korea, Panama and all over the United States. After Mr. Vásquez retired from the army, the family settled in Weslaco, Texas, not far from where Mr. and Ms. Vásquez had both grown up. Ms. Vásquez was strongly influenced by her grandmother and her mother. "My grandmother couldn't read or write, but she was treasurer of the women's group. She tied the offerings into the four corners of a handkerchief, one corner for World Thank Offering, another for gifts, and so on. She always gave accurate treasurer's reports according to what was in each corner." Ms. Vásquez's mother, Elida Gonzalez, had a sixth grade education and was a migrant worker, but "she was active in the Women's Society of Christian Service at the church in Elsa," Ms. Vásquez said. "I saw Mother going to meetings, and then going for a day or two somewhere with the women. ... My love for Mujeres Metodistas Unidas (United Methodist Women) came through Mother." 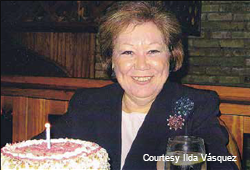 Ms. Vásquez joined the local United Methodist Women after moving to Weslaco. "The ladies embraced me and invited me to the meetings and I'm still there!" she said. "I didn't just go to the meetings. I had a burning desire to know more than what I saw locally. I went to district events and started going to conference events and the School of Christian Mission. And then they asked me to be a district officer and president of the district and finally a conference officer." After attending some district events, Ms. Vásquez was impressed. "I knew that the organization was a whole lot more than I had thought," she said. "I started subscribing to response and New World Outlook and learning more, reading more. Then I became active at the conference level." She told her husband, "This is what I'm going to pour myself into." Ms. Vásquez has served at the local, district, conference and national levels of United Methodist Women. She was president of Southwest Texas Conference for four years and president of the South Central Jurisdiction for four years, which also means she served as a director of Women's Division that quadrennium. "I just embraced United Methodist Women and have done everything that I can to help other women to know about United Methodist Women and encourage them," she said. "This organization is for all womennot just the educated or uneducated or wealthy or poor. Every woman is offered the same opportunity. ... United Methodist Women is a total, inclusive group. Everyone is welcome." Ms. Vásquez knows every woman has something to contribute to the betterment of the world, even if she doesn't yet know it. United Methodist Women helps women discover their gifts. "The benefits that you receive from their investment in you are tremendous. United Methodist Women invested a lot in me. How could I not think that they would be in my will?" Ms. Vásquez said. She decided to support the organization that she loves through a gift from her will. In regard to her decision, Ms. Vásquez stated, "God has been in our every decision we've made as a family." She knows God helped direct her to United Methodist Women and on into the future to ministry with women, children and youth around the world.